This crimson and white explosion is at once sweet and daring, an irresistible union of purity and mischief that can brighten any window sill. 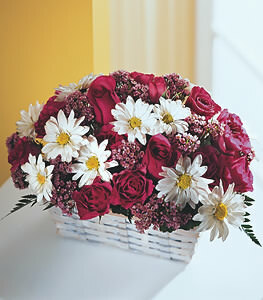 Flamboyant hot pink roses and white daisy pompons make a frilly showing in a rectangular basket. Thank you very much for such quick delivery service.ý I have already heard from the recipients and they were delighted with their flowers.